I picked this up cheap, not expecting that much of it, but it’s actually a nicely illustrated and, although fairly basic, accurate and fairly detailed account of the Vikings and their times, sociology and mythology, with plenty on the gods and, as hinted in the title, Ragnarok. The illustrations are very nice on the whole (sometimes it feels a bit small, as if this paperback is a reprint of a larger hardback), bringing together art and archaeology, drawings and photographs, and there are translated quotations from the sources where appropriate. A fair bit on Iceland, including some lovely pictures, and well worth the four quid I paid. No, I’m not sure how these have got out of order, either. This is a book about Snorri Sturluson, Icelandic writer and law-speaker and generally somewhat argumentative chap, and his Edda and other poems and works that he wrote or brought together. It pulls together history, myth and literature in what aims to be an accessible manner. It’s a complicated story, let’s face it, and gets all interleaved with the folklore and myths, a good idea in some ways but potentially a bit confusing. I do honestly think that I would have struggled with this book if I hadn’t already had something of an understanding of Snorri, the historical background and the Norse mythology. The author does make a good attempt at keeping it all straight, reminding us who is related to whom and providing family trees and maps. Original sources are quoted (although the author states that she mixes different translations and sources with some of her own translations, which feels a little odd to me), and sometimes the text itself starts to feel a bit like a saga text, which can get a bit disconcerting when you’re not sure whether you’re dealing with quoted or direct wording. The references are the kind where there are no asterisks and footnote numbers, with the references in the back being linked to the text with a few words or expressions – I did get a bit lost trying to trace some references in this way, although maybe it’s aimed at improving the accessibility of the book. I did find this enjoyable with a lot of good solid information – there are nothing but glowing reviews on Amazon, so I’d be interested to know what other people thought of this one. On Saturday, we had a trip to Macclesfield to meet up with Editor Laura and her other half, Mark. 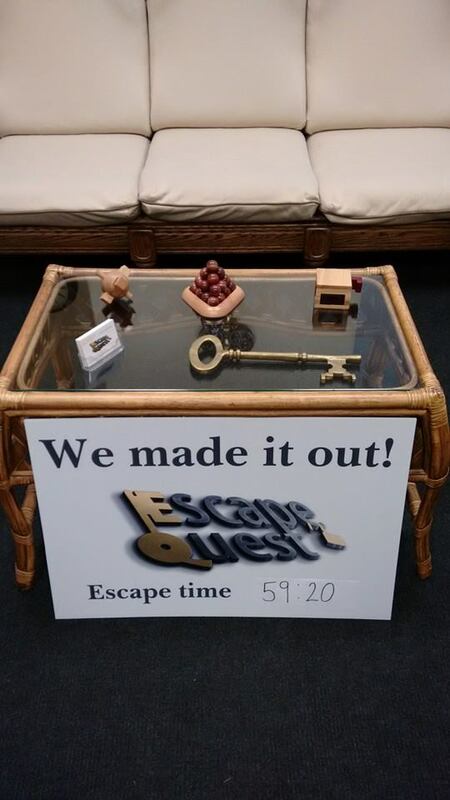 They’ve been doing these “escape rooms” recently, which is a thing where you’re “locked” into a room and have to solve puzzles and riddles to get a key to get out, working out chains of things along the way (oh look, Wikipedia has a page explaining them). The one we went to was called Escape Quest and is an independent one, run by a lovely couple – and although I wasn’t sure I wasn’t going to get frustrated, be unable to do it, or panic, I really did enjoy myself – as we all did – and had a fab time. And we escaped! Of course we did! You get an hour … Anyway, you can read more about the one we did here on their website, and there’s a Facebook page where you can find a photo of me, Matthew, Laura and Mark! I’ll also be featuring them on my Small Business Chat series on my Libro blog in due course – I’ll pop a link up here when I’ve done that. The other thing Macclesfield has, it turns out, is a nice big The Works and lots of charity shops. We didn’t even go in them all in the end – that’ll be for another visit. And they were ones I (obviously) hadn’t been in before, and look what happened! Deborah Devonshire – “All in One Basket” – the last surviving Mitford sister who passed away quite recently – this is both of her lovely memoirs in one volume. “Britain from the Rails” – railway journeys in the UK and what you can see from the train. Good for armchair and real-life travels, I think. Michael Cunningham – “By Nightfall” – one of my favourite authors but I’ve dropped off from keeping up with his new ones. Excitingly, there were a few copies of this one, so Laura got one, too! Georgette Heyer – “The Unknown Ajax” – I’ve got quite a few in this edition now, and who can resist a Heyer they haven’t got? Not me! Debbie Macomber – “The Inn at Rose Harbor” – I’ve had the second book in this series on that special pile on my TBR for books in series that I’m waiting to get up to for aaages – now I can read both of them. Or whenever I get to this one. Dorothy Richardson – “Pilgrimage 4” – And this one will replace the Macomber, as I’ve got Pilgrimage 1 (but haven’t read it for ages) and not 2 or 3. Ones to look out for – I’m sure they’ll appear at some stage! The only Virago Green in the pack, but not one I see often. Harold Nicolson – “Diaries and Letters 1930-39; 1945-69” – We know that I’m a little obsessed with this family – how lovely to pick up these ex-library copies in the Oxfam books (along with the Richardson and Roy Jenkins books, and I had a lovely chat with the lady working there, who is reading ALL of the Booker shortlist books for each year, working her way backwards. No, she doesn’t have a blog). These will be a real treat, although I fear there are Other Volumes which I will need to find. John Campbell – “Roy Jenkins” – And regular readers will know how much I like a political biography, and this is supposed to be a good one. So really all of these books fit my collection management policy and Don’t Count – right? Because working from home means you can stand outside your front door, staring into a box and inviting your neighbours to do so, too. Two books which have a loose theme of romance today – one very much in its genre, the other pretty genre-defying, one told from the viewpoint of a woman, one from a man, both about family but with different ideas about what family actually means, one written and published a while ago and showing its age, one rather more modern. Oh, and an extra which is a little book of short stories, again in the romance genre and spanning a number of years. Confused? Read on, and hopefully all will become clear. I went to a lovely presentation by Helen in September 2014 (more about that at the bottom of this review post), having only read her “Spilt Milk, Black Coffee” before but having met her a few times. I picked up this and “My Summer of Love” (to be read and reviewed soon) and read this one on the journey to and from Oxford last weekend, as it was just the right size to pop into my handbag. I was actually disappointed to be really sleepy on the trains, because I really could not put this down, except when I fell asleep! It’s a cracking read as well as an interesting musing on celebrity, identity and family. John finds himself, somehow, applying for a job as nanny to a reclusive star, looking after her new baby and a somewhat disturbed six year old boy who isn’t clearly related to anyone in the household. At his interview, John falls hard for the mysterious and slightly grubby Hepsie – a wonderful character – a previous incumbent, and meets the deliciously silly but at the same time menacing Brian, stylist to the stars. Ending up in a decaying farmhouse in a miserable village, the book is shot through with a gothic feel and deadpan, almost camp tone, which reminded me of Paul Magrs’ (non-magical) novels in a way that her other book didn’t. There are also shades of “Cold Comfort Farm” as mysterious static caravan-dwelling women in denim shorts circle ominously. Is John’s relationship with Hepsie real or in his head? Who did live in the house before? What does Misty Moore get up to in her private apartment at the top of the house? Is someone creeping into the house at night, or is it actually haunted, and why’s there a rabbit in that cupboard? What’s more, who and where are Mouse’s parents? Narrated from a point a decade after the events being told, you become desperate to know what’s happened in the intervening years and craving for more – hints are dropped and John’s life is irrevocably changed by the events of the year he was 19. With spare elegance and masterly writing, the plot thickens, the fairytale world wraps around the characters, and even when “real” people intrude into their space, it’s to act as a kind of chorus. Some great set-pieces, and altogether superb and unputdownable. Gentle romancy / stories of communities writer Debbie Macomber is reissuing some of her older books in e-book editions, and I managed to snaffle a copy of this one for Kindle. Simon and Angie were childhood sweethearts, getting “married” at 17 so they could consummate their love. But she was from the wrong side of town, and something happened to do with a sum of money, what is obviously going to turn out to be some misunderstandings, and her and her father leaving town in a hurry. Twelve years on, she’s living away from their home town, running a floristry business, and he’s the boss of the bank, and Angie makes a return trip to the small town as she prepares to get engaged to her dull but dependable boyfriend and wants to draw a line under her old life. Of course, Simon and Angie meet up; of course sparks fly; and then they spend quite a large portion of the book zipping between their respective towns and battling with their families. Issues with Angie’s father are very clearly spelled out here and could probably have done with a bit of editing, I have to say. Will the course of maybe true love (but with whom?) run smooth? Will someone get married to someone else in the end? It’s quite obviously an older book and curiously old-fashioned in the morals department – or maybe this is just more obvious than in later books. Angie does like to keep herself pure, and that seems a bit grating in this modern world, although obviously there are readers who prefer that kind of aspect, it just makes things a bit unbelievable. There’s also a rather odd bit right at the end which I won’t spoil for readers but seems a little implausible. Anyway, I’ve realised that the Macombers I prefer are the ones with an ensemble cast set in a community, where the romance is diluted by other friendships and relationships. But it was a pleasant read. This is a book of five short stories and a novel excerpt which was published to celebrate Matthews’ 25th book in 17 years. I have read a few of hers and they’re well written and engaging, and these stories are just the same. I wasn’t expecting introductions to each of them, which explain the background to her writing them and having them published, which make it a nice friendly read. The stories are varied and certainly not all happy endings and romance; the first one, her first ever, was interestingly dark, and the one set in Venice gave a nice surprise. Very enjoyable – and I picked it up as a free pre-order which was a thank you to members of her mailing list and Facebook page. I’m currently reading quite a hard book about Snorri Sturluson (while I try to learn some more Icelandic – it’s not in Icelandic, I hasten to add, but is clotted and thick as an old saga translation) and an interesting one which is less prurient than I expected about the offspring of rock stars. So some varied reading for me this month but I am getting through them! What are you reading? Two books, one from last month and one from this – linked by the fact that although one’s about the upper class and one about the working upper middle or nouveau riche class, the former mentions the latter at one point, which I quite liked. They’re both good reads, too, and, incidentally, both ones that I’ve read along with my friend Ali! I’ve also got one acquisition, and that’s a tiny one so hardly counts. Are you having a good March of reading so far? I will admit to having read almost three other books but being behind on my reviewing at the moment (oops). A Virago kindly sent to me by Karen from Kaggsy’s Bookish Ramblings, this is effectively a novel about Vita, her family and her love for her home at Knole, which she lost as a result of inheritance laws (and yes, I know I bang on about “Death of the Author” and Reception Theory and all that, but this just screams autobiography at you if you know anything about Vita: we’re all allowed to drift away from our pet theory from time to time, aren’t we!). The story is a portrait of Sebastian and Viola, twins who both have aspects of Vita (and also recall “The Heavenly Twins“), and their society mother at the very height of the Edwardian era, all country house weekends and reams of affairs which are kept from the masses by an elaborate scheme of facades and substanceless marriages. The outsider, Anquetil, very much not “one of us”, observes a house party with detached interest and has a profound effect on both twins, although it’s not clear quite how he’s affected them at first, as Sebastian turns down an opportunity and Viola starts up a correspondence. A middle-class woman of the working part of London life is drawn into Sebastian’s life but is seemingly the only person in the book with the courage to preserve her own moral code – it’s not quite clear who is being criticised, but there are some powerful scenes to this theme. She is the link to a Forsytean world of property, money and conservatism, which is mentioned as very much in opposition to the morally free upper class milieu. Vita is pretty savage about high society and its hypocrisy, but also elegiac about a declining way of life on a country estate which is full of respect and honour between the upper class and the people. A good read which Vita rejected as being unrepresentative of her work (it was, however, a bestseller) with an introduction by Victoria Glendenning which rather amusingly urges people to go and visit Knole (more death of the Death of the Author there). Ali happened to have this to read at around the same time, and her review is here. This book was published in 1930 so fills a year in my Reading A Century project. The final book in the original (but now first of three) “Forsyte Saga” trilogy, and in this one we finally get to Fleur, who everyone seems to remember from the TV series, plus the bit where you really need a family tree at hand to work it all out, as the family feud carries on to affect the next generation. Young Jolyon’s son Jon and Soames’ daughter Fleur haven’t crossed paths, as the two branches of the family have pulled firmly away from each ther. Each is the apple of their parent’s eye, and efforts have been made not to let them know about the rift. But with a horrible inevitability (and there wouldn’t be much novel if they didn’t), they do meet at an exhibition, and there are more horribly predictable circumstances as they manage, in the new freedom of the 1920s, to arrange to meet up several times. The wider family setting narrows a little in this volume – only Timothy is left from the older generation, and we are then confined, apart from some mentions, to Young Joylon’s older daughters, June and Holly, and Holly’s husband Soames’ nephew, who caused conniptions in the last volume, but they’re happily settled now. There’s plenty on how the Forsyte inheritance in terms of personality is getting weakened, while the inheritance in terms of money is building and strengthening, with Soames controlling it pretty well single-handed, although Timothy’s will does throw a slight spanner into the works. And some of the family, in going into farming, is returning interestingly to the roots of its founder. Family loyalties are strained and feelings run high, marriages are successful or not, and there’s s stressful process of finding out the truth. There’s an annoying Frenchman thrown into the mix which allows Galsworthy to be (slightly irritatingly) arch, and altogether it’s a successful ending to the first trilogy and whets the appetite for more. Published in 1921, this also fills in a year in my Reading A Century project. I think I’m the first to get a review up, but will link to Ali, Bridget and Karen’s as they publish them. We had a lovely day out in Oxford yesterday with my Auntie Linda, Cousin Martin and Martin’s partner Rad. 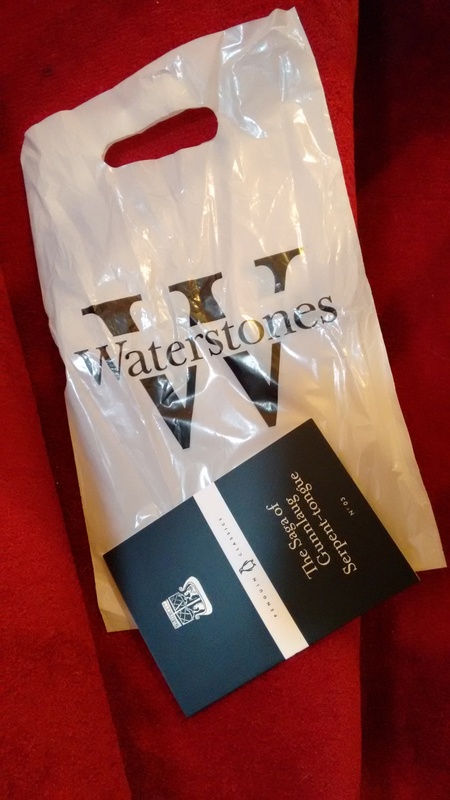 I was very restrained – in fact we didn’t really go near any bookshops, but did have a lovely time in the Natural History Museum, but we popped into Waterstone’s and I did pick up ONE of the new Penguin 80s (80 books at 80p each to celebrate 80 years of Penguin). I found out about these from Kaggsy’s tempting posts on the subject, and much as I’d like a complete set, I kept a lid on that tendency and treated myself to “The Icelandic one”. 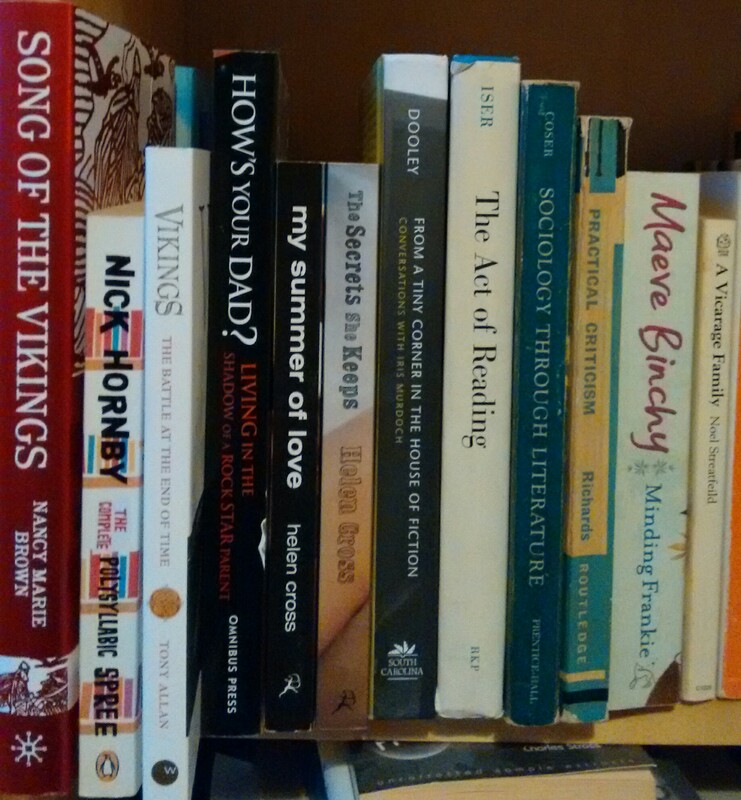 I’m currently reading Helen Cross’ very good “The Secrets We Keep” which I almost couldn’t put down this morning, and have finished a good book on the Vikings and that Nick Hornby, about which I found little to say in my reading journal. More reviews soon! I can’t have read any Sinclair for AGES as he doesn’t appear if you search this blog. I have read his M25 one, at very least, and his psychogeographical works are entertaining but quite dense (I’ve not read any of his novels; not quite my thing, I fear). This one is a musing on John Clare, the Essex peasant poet who famously went mad and did some long walks, giving Sinclair a handy excuse for going on some long walks and musing on madness. So he walks in Clare’s footsteps with a variety of his friends who have featured in other books, and there’s also a rather sweetly prosaic and familiar-feeling search for his wife’s family history, too, with some lovely scenes of them delving into archives and consulting local history librarians, all mixed in with his standard poetic psychogeography. As I know very little about Clare, it wasn’t as immediately gripping as his walk around the M25; but I did love the descriptions of his family life and the walks themselves, and it was fascinating to see more than one mention of Iris Murdoch, which is something to follow up on (I really can’t remember if he mentions her in his other books). His prose is dense as ever, but does come alive when he’s walking with his friends and wife, and it was a satisfying read, if not the easiest read on the shelf. This one was also not the easiest of reads, but for different reasons. It’s the memoir of Armstrong’s time directly after leaving holy orders, with a brief description of the background of her time as a nun, and taking us up to the real launch of her career writing about comparative religion and the history of religion. Matthew has read one of her big books on the history of religion and I’d vaguely heard of her story, so I was interested enough to put this aside when it came to me in a box of BookCrossing books to sort through and release. In the book, Armstrong starts to find herself and establish an identity outside of that of a nun, and she also gradually discovers that the fainting fits that she’s had since the nunnery were not, as the nuns and a series of psychiatrists try to make out, attention-seeking behaviour, but a progressively worsening form of epilepsy. Now, this is mentioned on the back of the book, which is fair enough, and I understand that not everything can (and I don’t want to get into the trigger warnings discussion here), but what is not mentioned is the equally major and important theme of eating disorders, related to both Armstrong and two of her friends, which I would have preferred to have a warning about, personally. I thought this might be one of those things that everybody knows, but apparently not. Anyway, consider yourselves warned – it’s not that graphic but is potentially triggering or (in my case) upsetting. Anyway, it’s an interesting read in general, although the religious theory gets a bit intense towards the end, and I won’t be rushing out to pick up the first bit. There was a mention of John Clare and a page of musings on Iris Murdoch, which rather amusingly tie the book to the Sinclair in a more useful way than I thought the theme of mental health struggles would. Currently reading: I’m currently leafing through Nick Hornby’s “The Polysyllabic Spree” – unfortunately, I’m not that fond of Hornby as a writer (OK, I love “High Fidelity” but he leaves me a bit cold elsewhere) and I’m not massively into the books he reads as he keeps a reading diary for a magazine for a couple of years. The conceit of the board of editors referenced in the title is too twee and fanciful for me, but it’s a book about reading and about buying books, it’s not too laborious a read (although it has very small print, making it a smaller and thinner book than it would otherwise be), so I’m carrying on with it. The other current read is the third Forsyte Saga book, “To Let”, and I’m very much enjoying that! No more books in … so far … What are you reading at the moment? Well, here’s the current state of the TBR and I have chipped away at it a bit since February’s excesses, even though some books have come in (more on those later) and I didn’t feel like I’d been reading much this last month. The front row ends with Dolly Parton. At least I was fairly frugal with my acquisitions last summer, so I’ll be on September’s books soon, which feels a bit better. I’m currently reading Karen Armstrong’s “The Spiral Staircase”, which is about her post-nunhood life, and is OK although there were a few themes I wish they’d highlighted in the blurb. Not getting into the trigger warnings debate, but when there are two main themes and the blurb only mentions one, it’s a bit annoying. I’ve also finished but not yet reviewed Iain Sinclair’s “Edge of the Orison” which was Quite Hard but makes a nice mental-health related pair with the Armstrong, and Vita Sackville-West’s “The Edwardians”, recently also read by Ali, which has intersections with the world of the Forsytes, handily enough. Coming up on the TBR, I have two books about the Vikings – the first one is a biography of Snorri Sturluson, who collected many of the sagas together in manuscript form but was also a bit warlike himself (I’ve been to his house, which was very exciting), and a more picture-book style one on the Vikings in general. This will be good preparation for our upcoming return trip to Iceland (I also have that lovely book of sagas to continue dipping into. Then I have Nick Hornby’s reading diary, what I’d call some “easy” books – one on rock stars’ children and two novels by the lovely Helen Cross, before diving into some Iris Murdoch stuff and some slightly elderly literary theory which should help with my Iris Murdoch research (so I’d better get on and get my new business books written before I get there, right?). Of course I’ll also be reading my third book in the Forsyte Saga, “To Let”, which will conclude the first three-volume set, and I might start my next Anthony Trollope, too, although that might need to stretch over a couple of months. In acquisitions / confessions, I fear I’ve missed a few as I have had a couple more in from lovely friends, but I’ve lost track so you’ll have to see those as I read them (in the “fullness of time”, as I somewhat euphemistically call it). 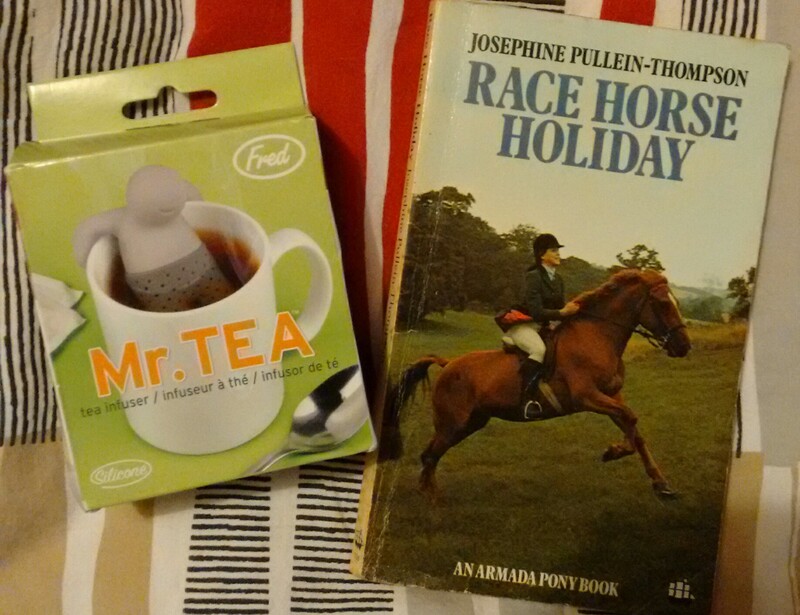 I had a small bonanza on Saturday, first of all collecting Josephine Pullein-Thompson’s “Race Horse Holiday” and a very amusing tea infuser from the parcel office, courtesy of my friend Verity. I can’t believe she found one I didn’t already have, but so she did! And it fills in 1971 in my Century of Reading, too – hooray! 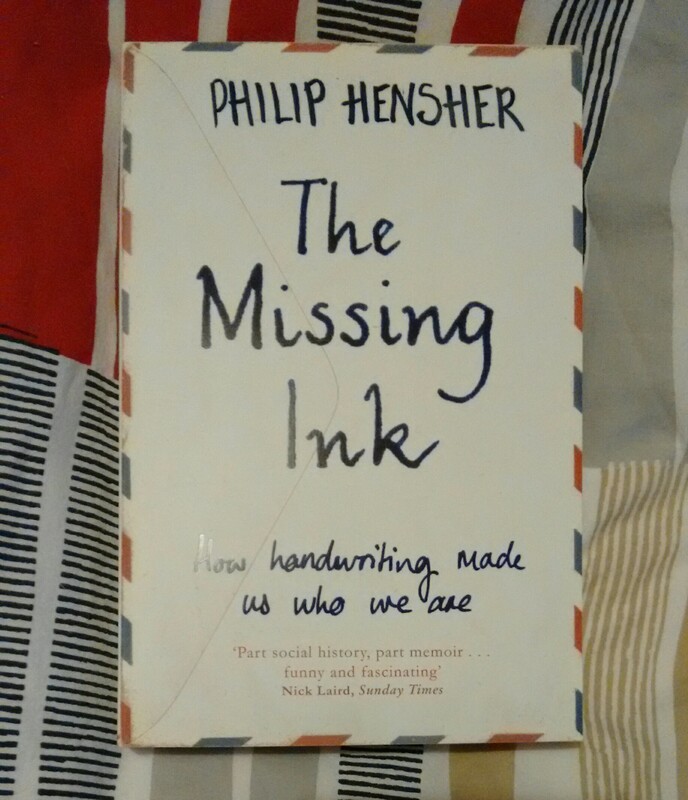 And then in The Works, I found Philip Hensher’s book about handwriting, “The Missing Ink”, which was on my wishlist, so one down, 3,000,000 to go off that list and it looks like a lovely read. 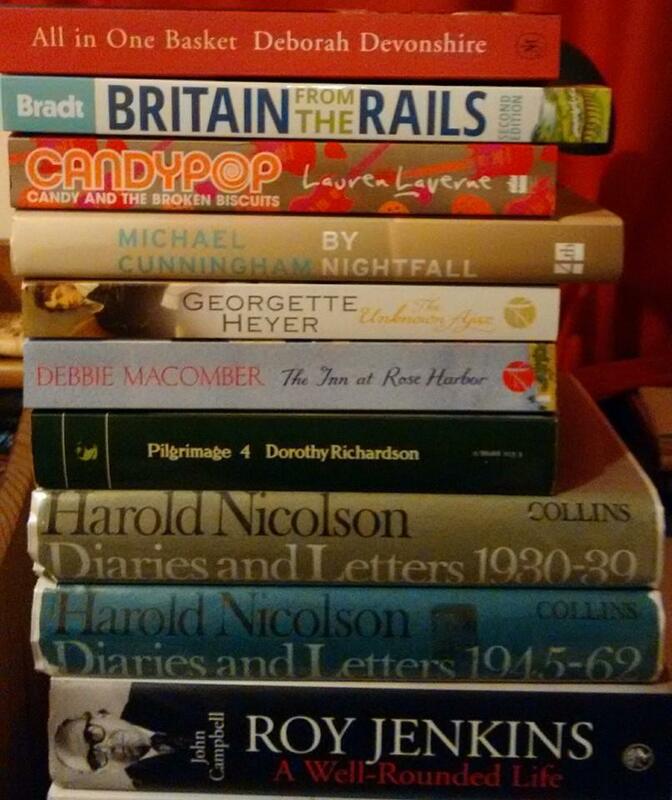 I read seven books in February, but I should have a couple of bus and train journeys this month which will encourage some nice long bouts of reading, so here’s to a good reading month for everybody. What are you tackling? Have you read any of my upcoming books?